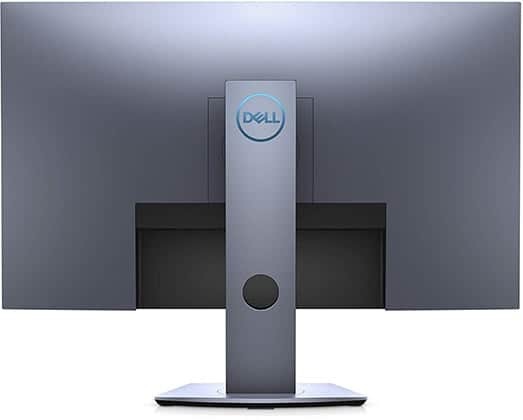 The Dell S2719DGF is a 2019 27″ 1440p 144Hz 1ms gaming monitor. In comparison to the older similar TN models, it introduces a few new features such as an overclockable refresh rate to 155Hz and delivers premium quality at an affordable price. Based on a TN (Twisted Nematic) panel by AU Optronics that’s used in the previous and popular 1440p 144Hz 1ms models as well, the Dell S2719DGF offers pretty much the same picture quality. You get the standard contrast ratio of 1,000:1, a peak brightness of 350-nits, 160°/170° viewing angles, a 1ms response time speed, and true 8-bit color depth for 16.7 million colors and standard sRGB gamut. So, you get a lower contrast ratio than that of VA panels meaning that the black shades won’t be as deep and vivid but rather grayish in comparison. The colors aren’t as vibrant as neither those of IPS or VA, but you get the rapid 1ms response time speed which is ideal for fast-paced games. The narrow viewing angles will cause the image to shift in contrast and color when the screen is looked at skewed angles, but this shouldn’t be a problem as long as you’re directly in front of the display. Thanks to 1440p, the Dell S2719DGF 27″ monitor has a rich pixel density of 108 pixels per inch which makes for crisp details and plenty of screen space available. The Dell S2719DGF input lag performance is impressive with just below 4ms of imperceptible lag. Even professional gamers won’t be able to notice any delays. Moreover, the 1ms response time speed further complements the low input lag as there’s no noticeable trailing of fast-moving objects in FPS and racing games making for an overall responsive and immersive gaming experience. In the OSD (On-Screen Display) menu, you will find the Overclock option via which you can easily overclock the monitor from the native 144Hz refresh rate to 155Hz for a small boost in motion clarity. 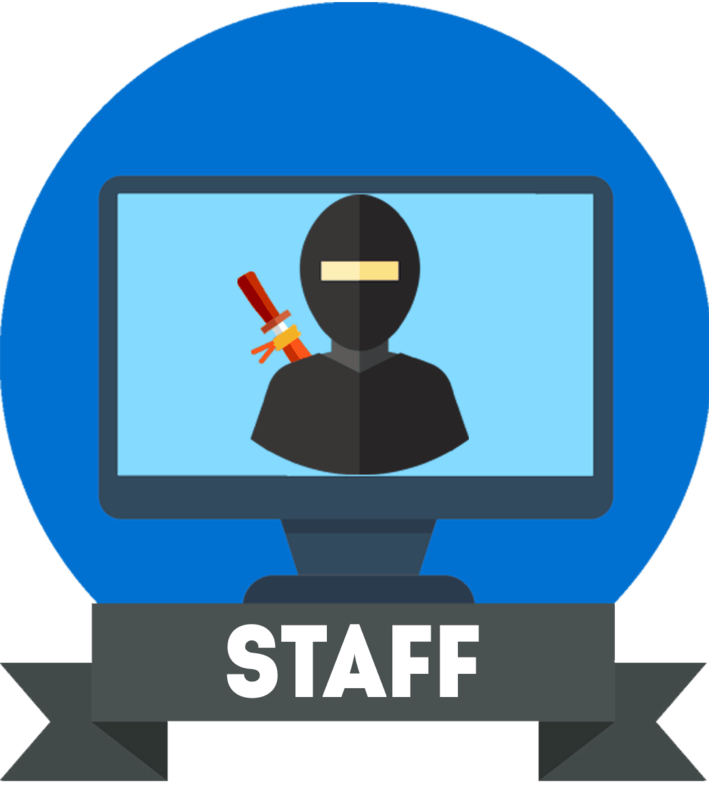 Overall, the monitor’s performance is flawless without any defects such as dead/stuck pixels or excessive backlight bleeding. The backlight is flicker-free and has a low blue light filter, so you don’t have to worry about headaches or eye strain caused by prolonged use of the screen. Out of the box, the picture quality isn’t as good as it can be, so spending several minutes calibrating the display is recommended for the optimal image quality. The Dell S2719DGF 155Hz gaming monitor supports AMD FreeSync which provides a variable refresh rate (VRR) that eliminates screen tearing and stuttering. The VRR range extends all the way up to 155Hz when the display is overclocked while the lower end of the range is 40Hz below which LFC (Low Framerate Compensation) kicks in to help out with the performance. Although not officially G-SYNC compatible, FreeSync works on the Dell S2719DGF with compatible NVIDIA cards as well without any issues. The OSD menu is simple to use and easily navigated via the hotkeys placed beneath the bottom bezel at the right side of the display. 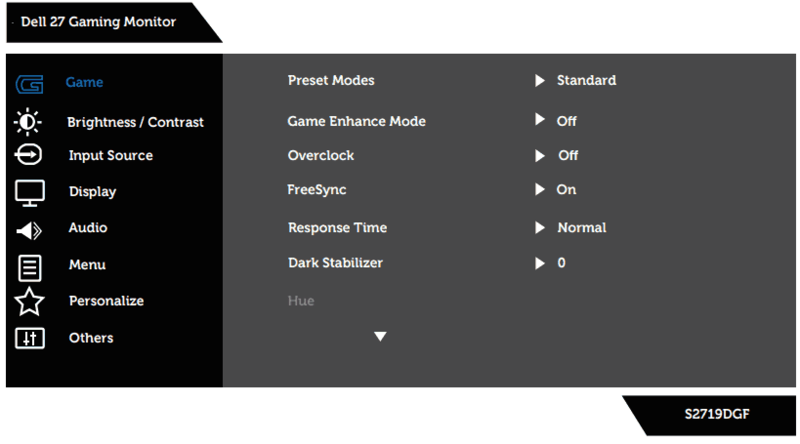 There are seven hotkeys in total which can be used for the following shortcuts: presets, FreeSync, Dark Stabilizer, Brightness/Contrast, menu, exit, and switching the monitor on/off. These shortcuts are assigned by default, but you can change them to other functions such as input source selection, volume, aspect ratio, etc under the ‘Personalize’ section of the OSD menu. There are three pre-calibrated picture presets for FPS, RTS, and RPG genres as well as three customizable profiles available. Other gaming features include an on-screen timer, a frame rate counter, and Dark Stabilizer which increases visibility in darker games by altering the gamma curvature. You will also find three response time overdrive options: Normal, Fast, and Super Fast. We recommend using either ‘Normal’ or ‘Fast’ as ‘Super Fast’ introduces a lot of pixel overshoot/inverse ghosting. Alas, there’s no customizable crosshair overlays nor backlight strobing technology available. The Dell S2719DGF offers a robust and versatile design with a dark blue-gray finish and no aggressive red or RGB “gaming” colors which most people will prefer. You can elevate the screen up to 130mm, swivel it by +/- 45°, pivot by +/- 90°, tilt by -5°/21° or mount it via the 100x100mm VESA mount pattern. Display connectors are down-firing and include HDMI 1.4 (max 60Hz), HDMI 2.0 (max 144Hz), DisplayPort 1.2 (max 155Hz), one upstream and four downstream USB 3.0 ports (one port with BC 1.2 fast-charging), and a headphones jack. The screen has a light matte anti-glare treatment. AMD FreeSync works over both DisplayPort (for AMD and NVIDIA cards and 155Hz) and HDMI 2.0 (for AMD cards and Xbox One up to 144Hz). 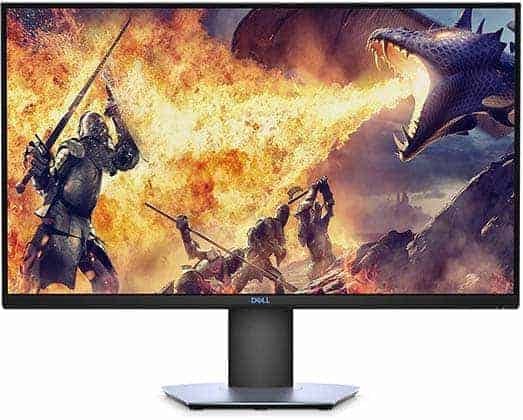 The Dell S2719DGF price is around $350 which is a great deal considering that similar monitors cost more yet don’t come with premium features such as 155Hz, ergonomic design, and rich connectivity options. Outside of the US, the Dell S2719DGF monitor may be significantly more expensive in which case we recommend you have a look at the HP 27xq. For $50 more, you may also be interested in the Nixeus EDG27S V2 which is a 27″ 1440p 144Hz gaming monitor with an IPS panel or the MSI MAG27CQ 27″ 1440p 144Hz curved gaming monitor with a VA panel. If you want the absolute best performance in fast-paced games, you could also get a 1080p 240Hz gaming monitor for the same price. 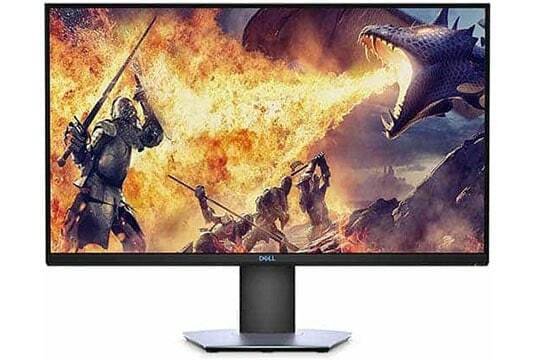 In case you prefer a fast response time over a high contrast ratio or vibrant colors, the Dell S2719DGF is an exceptional gaming monitor for the price. 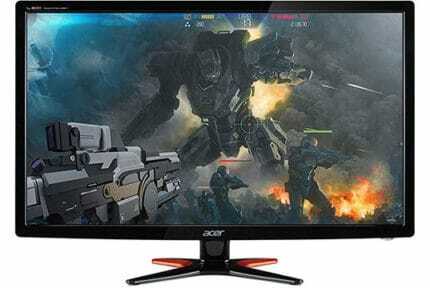 It provides a crisp image quality as well as a responsive gaming experience with plenty of premium features available. The Dell S2719DGF is the best 27" 1440p 144Hz 1ms gaming monitor for the money. 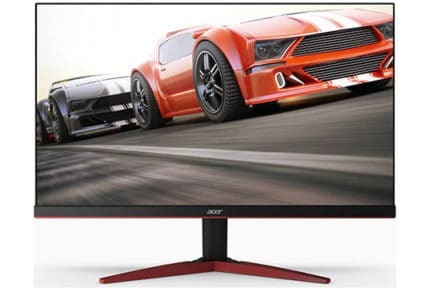 It offers a mediocre image quality but a flawless performance with plenty of premium features such as 155Hz, ergonomic design, and rich connectivity options.